Dallas Stars President and CEO Jim Lites and Jamba Juice CEO Dave Pace announced today, a three-year partnership beginning with the 2017-18 NHL season, bringing together two brands with a passion for sharing a fit and fun lifestyle and supporting their community. The agreement includes development plans to open Jamba stores within select Dr Pepper StarCenters, the first of which will debut at Dr Pepper StarCenter Frisco this October. "The Dallas Stars organization takes pride in cultivating mutually beneficial partnerships with North Texas-based companies like Jamba Juice," Lites said. "We are honored to be the company's first partnership with a professional sports franchise in the Dallas/Fort Worth Metroplex. Jamba shares our passion for giving back to the community in meaningful ways that impact the lives of many individuals." Throughout the upcoming season, Jamba and Stars fans can look forward to the partnership experience at both Dr Pepper StarCenters and American Airlines Center. A signature Stars smoothie will debut prior to start of the 2017-18 NHL season and will be available at all Jamba locations in DFW. Dr Pepper StarCenter Frisco, which serves as the Stars' official training facility, will be home to the first Jamba store within the partnership. The agreement also includes giveaways, in-game entertainment and access to freshly blended smoothies at Dr Pepper StarCenter events, offering Stars fans a comprehensive experience that supports a fun and active lifestyle. Recognizing the importance of instilling healthy lifestyle habits at a young age, Jamba and the Stars will be teaming up on several of the organization's youth fitness initiatives, including the Rookies Program, Fitness Stars and summer hockey camps. "By partnering with the Stars—a deeply respected hometown brand—we're able to share the fit and fun lifestyle that's at the heart of both organizations, and amplify our impact in the community," Pace said. "We look forward to opening Jamba in Dr Pepper StarCenter Frisco, and sharing our hand-crafted blends with Stars fans." To kick off the partnership, Jamba and the Stars hosted a charitable event in support of the National Multiple Sclerosis Society on Sunday, Sept. 10. 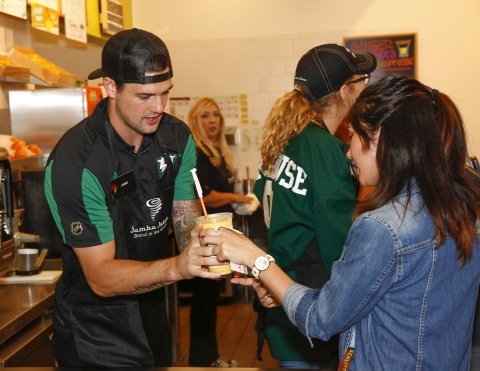 Dallas Stars captain Jamie Benn served smoothies to hundreds of fans at Jamba Juice at The Shops at Legacy. On behalf of Benn's appearance, a donation was made to support the efforts of local high school student, Savanna Roulette, who is raising funds for MS Society in honor of her mother and golf coach, who are both living with multiple sclerosis. Jamba, Inc. (Nasdaq: JMBA) through its wholly-owned subsidiary, Jamba Juice Company, is a healthful, active lifestyle brand with a robust global business driven by a portfolio of franchised and company-owned Jamba Juice® stores and Jamba Juice Express™ formats. Jamba Juice® is a leading restaurant retailer of "better-for-you" specialty beverage and food offerings which include flavorful, whole fruit and vegetable smoothies, fresh squeezed juices and juice blends, Energy Bowls™, signature "boosts", shots and a variety of food items including: hot oatmeal, breakfast wraps, sandwiches, Artisan Flatbreads™, baked goods and snacks.